You are on a volcano. The Republic no longer has a government. The directory has been dissolved, the factions are agitating, the time to make a decision has arrived. You have summoned me and my companions-in-arms to aid your wisdom, but time is precious. We must decide. I know that we speak of Caesar, of Cromwell, as if the present time could be compared to past times. No. I want only the safety of the Republic and to support the decisions that you are going to take. Caesar and Cromwell were both wildly successful generals (like Napoleon) who took over their respective governments. 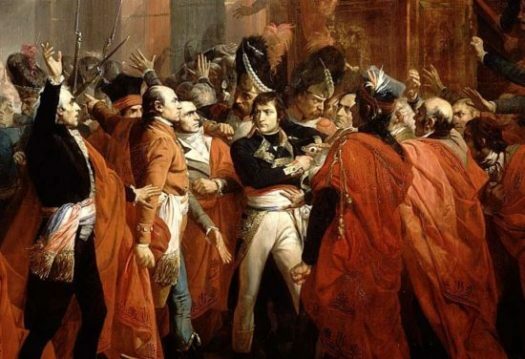 Napoleon was attempting to convince France’s leaders to overlook clear historical precedent and believe that he actually WAS trying to serve the government instead of subverting it. We are apt to shut our eyes against a painful truth, and listen to the song of that siren till she transforms us into beasts. Is this the part of wise men engaged in a long and arduous struggle for liberty?…For my own part, I am willing to know the whole truth, to know the worst and to provide for it. I have but one lamp by which my feet are guided, and that is the lamp of experience. I know of no way of judging the future, but by the past. And judging by the past, I wish to know what is in the conduct of the British ministry for the past ten years to justify those hopes with which gentlemen are pleased to solace themselves and this House. Napoleon told his fellow statesmen to shut their eyes and ignore the very history he was in the process of repeating. Patrick Henry told his fellow statesmen to open their eyes to history and let it guide their interpretation of current events. There are two lessons here. First, be very suspicious of anyone who asks you to ignore history. Second, to keep history from repeating itself, you have to know your history in the first place. Not knowing history is ignoring it by default.